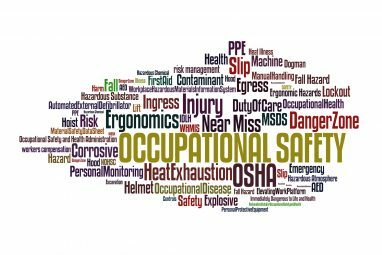 Have you or your company looked at the EHS readiness of your facilities ahead of when the next hurricane arrives? 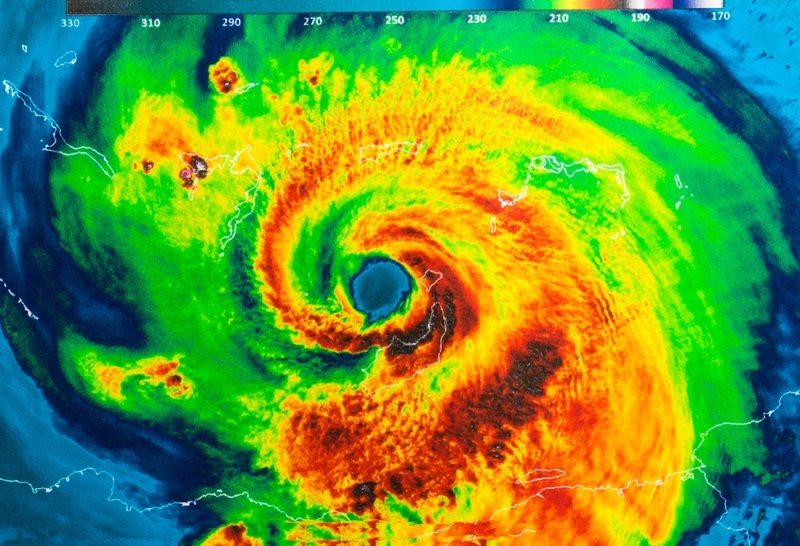 Last year’s Harvey and this past week’s arrival of Florence put into sharp focus the risks facing companies that don’t plan or respond effectively in the wake of such a catastrophic incident. 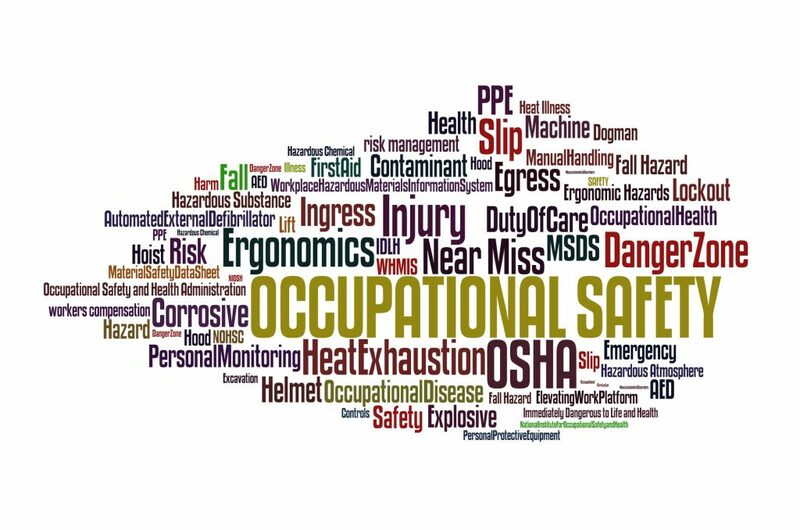 With the increased occurrence of severe weather events, the government will be less forgiving toward those who have not prepared for the EHS challenges associated with the next big event. 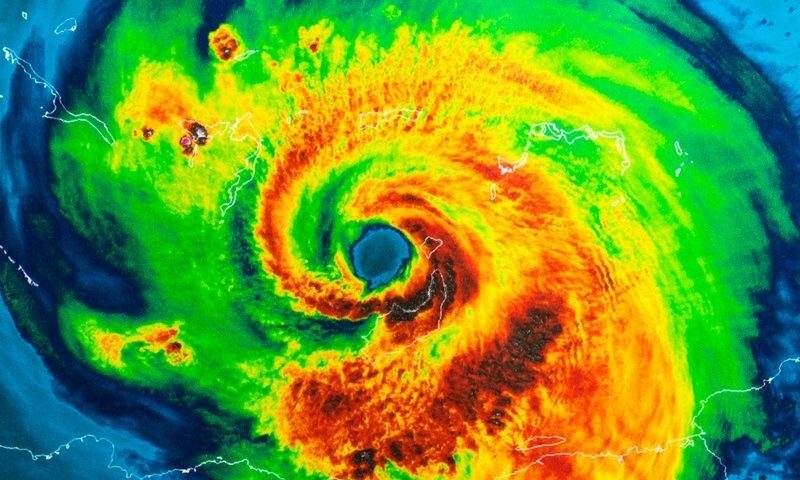 However, those who apply the right expertise (and experts) to assess risk, prepare their team and navigate the associated operational and legal challenges will be best positioned to weather the next storm. Gerald Herbert/APMillions of chickens have died and waste from pigs and coal ash has leaked into floodwaters in North Carolina as authorities work to control environmental threats and stop the spread of any contamination. But continued high water is keeping state and federal officials from knowing the full extent of the problem. Officials are most concerned that the coal-burning byproducts, animal waste, and even untreated human sewage in floodwaters could contaminate sources of drinking water. The Environmental Protection Agency said Monday that at least 23 public and private drinking water systems in North Carolina were not supplying water and that 21 others were operating with restrictions like a boil water advisory. Reggie Cheatham, director of the EPA’s Office of Emergency Management, said Monday that some sewage has been released into the floodwaters through sewer system manholes and, in one case, a power failure at a water treatment plant. Cheatham told reporters some of the untreated sewage had been released into the Neuse and Cape Fear rivers. 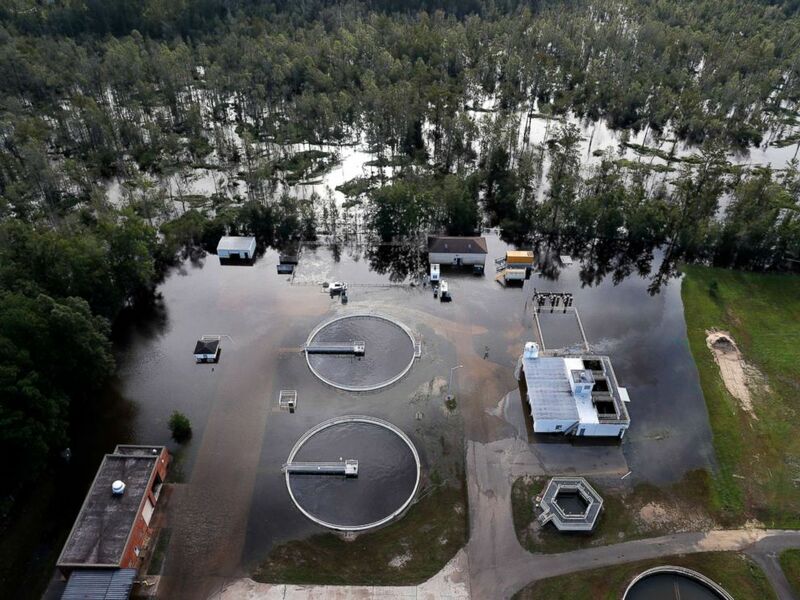 A wastewater treatment plant is inundated from floodwaters in the aftermath of Hurricane Florence in Marion, S.C., Sept. 17, 2018. Over the weekend Duke Energy reported that about 2,000 cubic yards of coal ash, the equivalent of about 140 dump truck loads, spilled out of a pond at an inactive power plant near Wilmington, North Carolina. An EPA official said the material spilled into a ditch that fed into another pond of water but did not reach the nearby Cape Fear River. 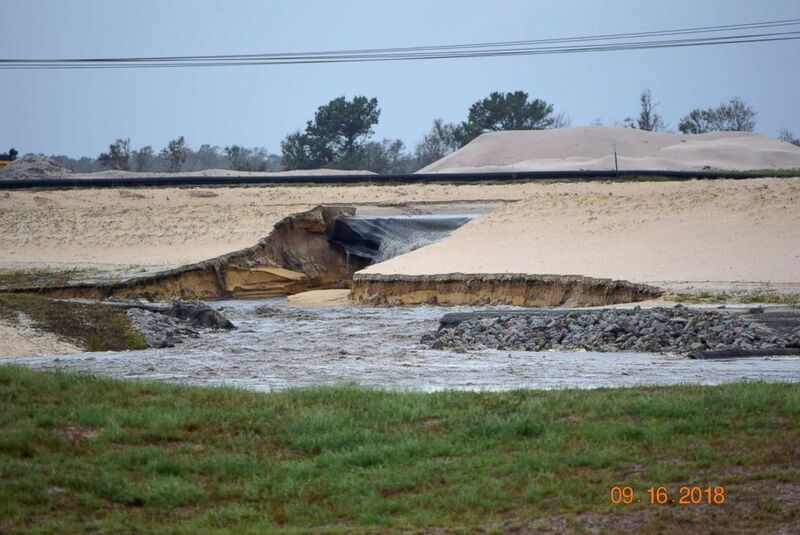 A rupture in the coal ash landfill at the L.V. Sutton Power Station in Wilmington, N.C., allows contaminated gray water to flow toward Sutton Lake, near the Cape Fear River, Sept. 16, 2018. Duke Energy spokeswoman Paige Sheehan said the company had been very aggressive in preparing its coal ash basins ahead of Hurricane Florence. “We believe our extensive basin closure work was instrumental in positioning us to reduce the storm’s impact – water levels in many ash basins near the coast were lower as a result of our closure activity, so the basins were better able to accommodate significant rainfall,” she said in a statement. Environmental activists were also concerned that some of North Carolina’s 3,000 hog farm lagoons — pits where farmers hold pig waste to be sprayed on fields as fertilizer — could overflow from the storm’s torrential rains. As of Tuesday, the state reported that several lagoons had overflowed or filled with floodwaters, with many areas still being assessed for damage. 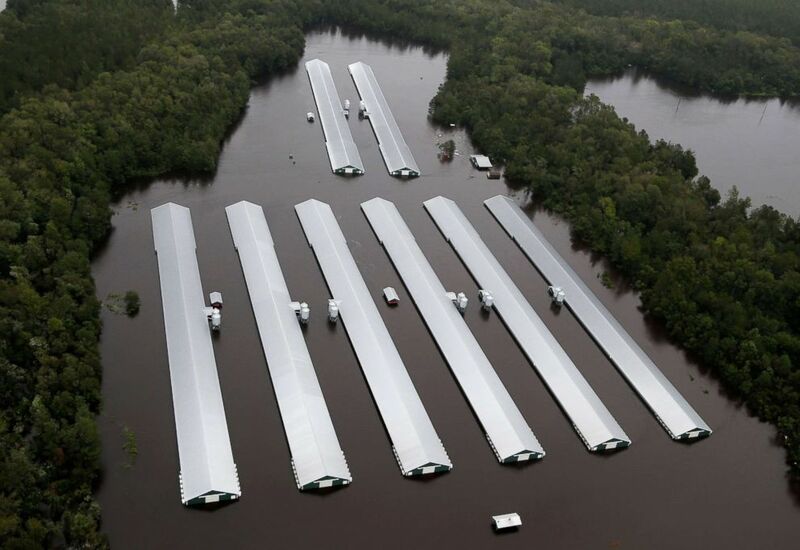 Hog farm buildings are inundated with floodwater from Hurricane Florence near Trenton, N.C., Sept. 16, 2018. North Carolina’s environmental agency reported that four lagoons containing pig waste sustained structural damage and 13 had overflowed, as of Tuesday afternoon. “We do not believe, based on on-farm assessments to date and industrywide surveying, that there are widespread impacts to the more than 2,100 farms with more than 3,000 anaerobic treatment lagoons in the state,” the North Carolina Pork Council said in an update. Numerous poultry farms in the area also have been flooded, and on Monday one company Sanderson Farms said an estimated 1.7 million chickens had been killed and they are unable to get feed to 6.3 million animals at farms blocked by flooding. 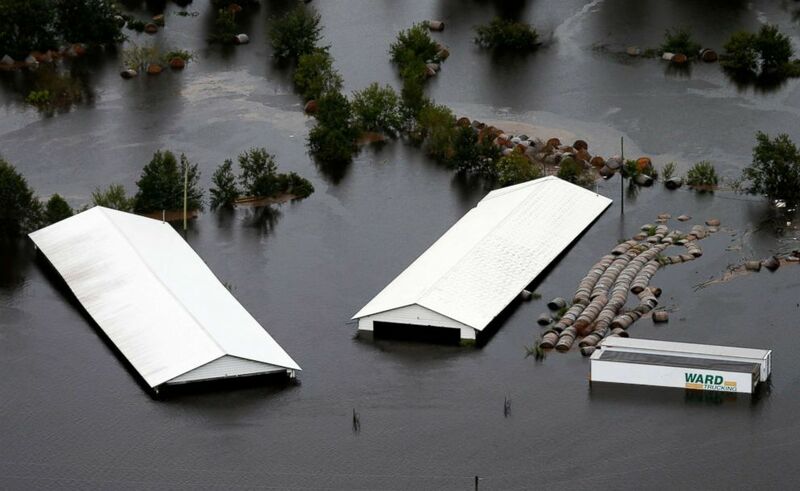 Chicken farm buildings are inundated with floodwater from Hurricane Florence near Trenton, N.C., Sept. 16, 2018. Farmers worked to lower the level of hog waste lagoons and move birds out of danger last week before Florence made landfall. Decaying carcasses from chickens and pigs combined with animal waste from farms contaminated floodwaters in North Carolina after Hurricane Floyd in 1999 and Hurricane Matthew killed millions of birds and some hogs in 2016. The North Carolina Department of Agriculture and Consumer Services said Wednesday morning that more chickens have died from Hurricane Florence than in Hurricane Matthew. As of Tuesday, 3.4 million birds had died and the state veterinarian estimated 5,500 pigs also were lost. The agency was still working to bring feed and fuel to affected farms. The numbers so far are already double the number of animals that died after Hurricane Matthew, according to The News and Observer. 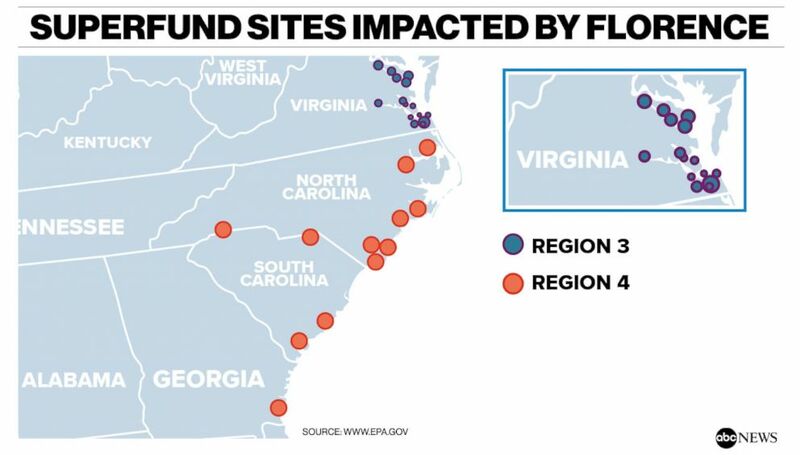 The EPA also will be inspecting Superfund sites around North and South Carolina in the coming days to find out if any were damaged, possibly causing the spread of dangerous material, such as pesticides or asbestos. The agency is monitoring 48 sites in North Carolina and 36 in South Carolina. 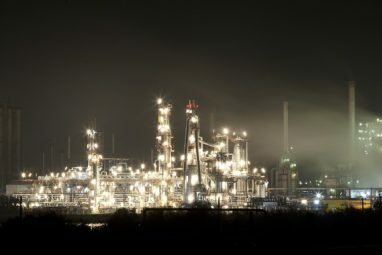 Though EPA officials said last week they don’t think there was a significant likelihood hazardous substances would be released, inspectors will be assessing the impact from flooding. The EPA also says that diesel fuel leaked from a train that derailed near Lilesville, North Carolina, because the tracks were flooded. An unknown amount of the fuel accumulated in a low-lying area and did not reach a nearby river, the agency said. The USDA and state agencies will offer some financial assistance for farmers impacted by the storm.